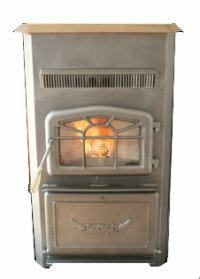 The Seraph Genesis 106 corn and multi fuel pellet stove is a european style stove with a cast iron door/viewing window incorporating a sunrise pattern. The solid state controller is programmable for any type of biomass fuel that can be fed through the stove. This is a very advanced controller which gives a read-out of the fire temperature and the exhaust temperature enabling fine control of the stove's combustion efficiency. As well as this, the display is in text, so you don't have to go to the manual to find out what a combination of flashing lights mean. Another function of the controller on the Genesis 106 is to display when routine maintenance should be carried out. The controller also has a child safety lock. Min. Heat Output 8,000 btu. Rear Vent Height 15 ins. Construction Type Fabricated steel with cast iron door. Because the stove must be lit manually, it won't cycle on and off with a thermostat but will drop to the minimum burn when heat is not demanded. Daily, or as needed: Remove any clinkers. Brush ash into the ash pans and empty as needed. Weekly: Inspect the hopper for a build up of fines, clean if required. Clean the heat exchanger. Monthly: Clean out the firebox and venting ports. Yearly: Empty and clean the hopper. Clean the stove thoroughly. Coat the firebox with a corrosion inhibitor. If you would like to leave a review of the Seraph Genesis 106, please use the form on the contact page.